A superb intermediate level helibike on an old mining railway trail behind Nelson City. Helicopter up to 3000ft and 15 kilometres downhill. 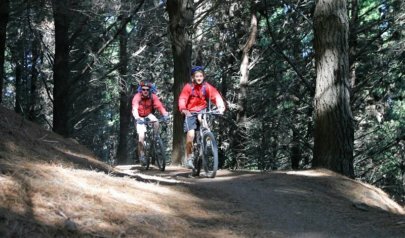 The Dun Mountain Trail is a classic mountain bike ride which provides enjoyable wilderness adventure only minutes from Nelson, for intermediate or expert mountain bikers alike. Accessing the mountain by a short helicopter lift, we start the trip with a brief alpine hike to the beginning of the Dun Mountain Trail; created from New Zealand’s first railway, built in the 1800’s for a failed mining venture, then fifteen glorious downhill kilometres through native and exotic forest back to Nelson City. Simply Wild Journeys are the original operator on the trail, having offered commercial trips since 2006. From where we land on the exposed and lunar like alpine terrain of Dun Saddle at 960metres (3000ft), you will gain stunning views into Mount Richmond Forest Park towards Marlborough and west to Tasman Bay and the Abel Tasman National Park. The trip then begins with a 20 minute hike (you can choose whether you do this) through the curious vegetation of the mineral belt to Coppermine Saddle, site of a chromite mine in the 1860’s, where the helicopter has landed and left our dual suspension Giant Trance mountain bikes. The trail starts off at 1.5 metres wide and then gradually opens up beneath mountain beech forest to 2 metres wide along the site of the original horse drawn railway, built to service the chromite mine in 1860. This was New Zealand’s first railway. 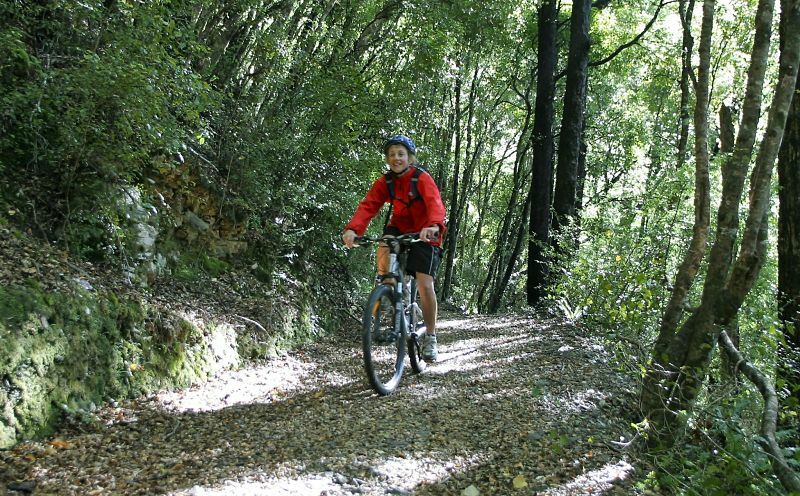 The trail winds down toward Nelson, eventually passing through pine forest, with excellent views of Nelson and Tasman Bay, before finishing on a single track alongside the Maitai River in Nelson City. 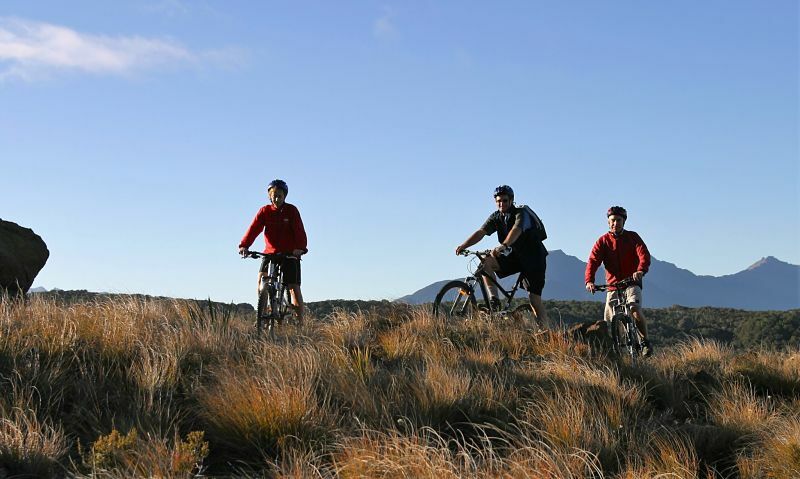 The trip suits a wide range of ages, but requires that riders are comfortable and have some experience of riding on intermediate level mountain single trails. We usually run this ride as a morning or afternoon trip. It is currently only a private trip, for small groups of individuals. We will collect you from your accommodation near Nelson city or meet you at the Visitor Centre in town if you have your own transport, at 9.00am or 1.00pm. If you are staying outside Nelson City we can collect you but there may be an extra charge. 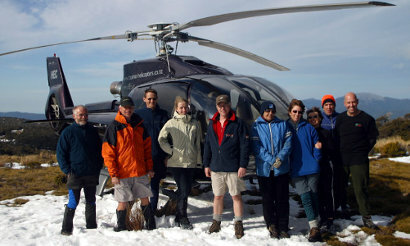 Depending on the size of your group, we will fly from our helicopter base or another location. The helicopter lift takes around 7 minutes, and we generally drop off a little beyond where we will collect our bikes to take in the spectacular views of the Mt Richmond Forest Park. After dropping us, the helicopter lands the bikes at Coppermine Saddle. We walk the 20 minutes or so on a rocky trail around to the bikes. At 1000 metres (3000ft) this is very much an alpine start, and you will ride back down to sea level. The trail, which has had a million dollar upgrade in the last few of years, is actually now a loop track, taking around three to five hours from the start at sea level to 1000 metres and back to sea level. As a helibike, we will just be descending one side of the loop, riding about 15 kilometres back to the city. The ride begins from Coppermine Saddle in open mountain tussock country on a section of the trail which is around a metre wide, with a surface which is a little rocky. Shortly the trail provides views of the ocean and Tasman Bay and the surface becomes smoother as it enters mature beech forest. You’ll often have a break at Third House, where horses were rested on the original horse drawn mine railway in the 1860’s before the last section through native bush and pine plantation to Nelson City. We’ll ride on trails back right back to the Visitor Centre near the middle of the city. Depending on your ability and whether you wish to do the short hike at the beginning, the trip usually takes between 1 1/2 and 2 1/2 hours. We will collect you from your accommodation and return you after the ride. This is included in the price if you are staying Nelson City or close by. Note :There may be an extra charge if you are staying in the Motueka area. We provide Giant Trance dual suspension mountain bikes, helmet and gloves. The helicopter lift is included. We provide morning or afternoon tea. What gear do I need? At its upper end, the trip begins in an exposed alpine area of around 1000 metres. You will need appropriate clothing for the weather conditions forecast, with wool or polypropylene underclothing and windbreaker if it is cold and windy. Running shoes or trainers are adequate footwear. We provide daypacks, bike and helmets. We also provide morning or afternoon tea appropriate to your trip (depending on your timing we can also provide a gourmet lunch). We will collect you from your accommodation. How difficult is the ride? 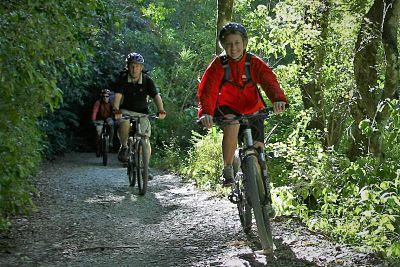 The walk and ride are accessible to most people who are used to wilderness walks, and who have at least intermediate level ability on a mountain bike. The walk is an alpine hike rather than a gentle graded track, but it is not difficult. The ride has recently had considerable money and attention spent on upgrading, and while a little rocky on the first section, is not technically demanding. When the track opens out it is easily ridden by all riders. The ride is graded a one in terms of difficulty out of a possible six, (6 being difficult). 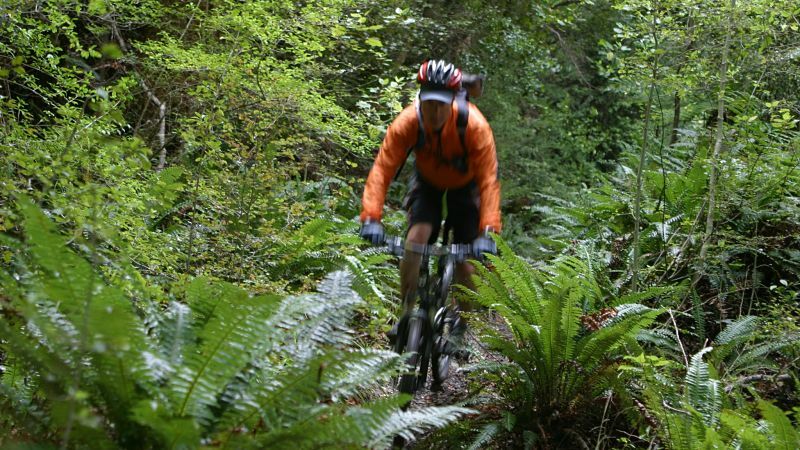 Despite the fact it is not technically difficult, experienced riders will thoroughly enjoy it as well. 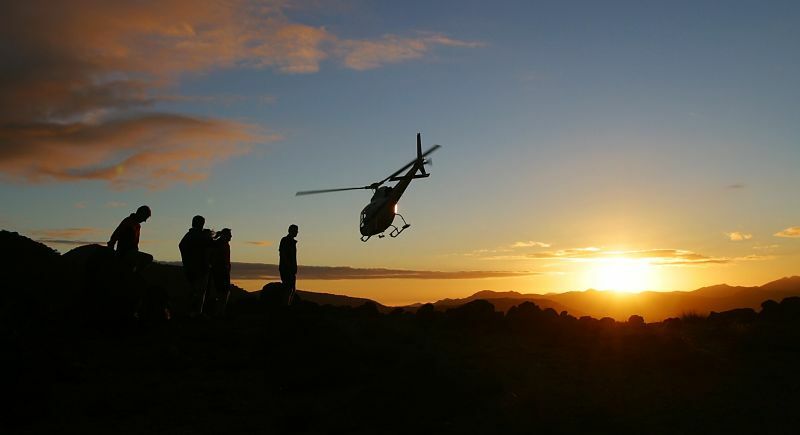 Since 2006 Simply Wild Journeys have been offering unique privately guided trips in the top of New Zealand’s beautiful South Island. 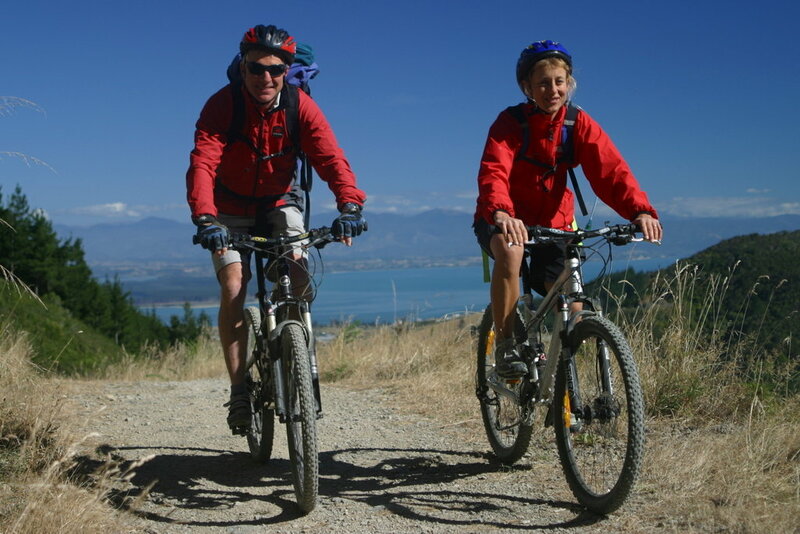 Encompassing walking and hiking, cycling and mountain biking, sailing, sea kayaking, and rafting, plus exploring the regions art, wine and culture, Simply Wild Journeys can provide you with a wonderful private day or multiday trip to remember during your New Zealand vacation. On a Simply Wild trip you can see, do and enjoy more at your own pace. 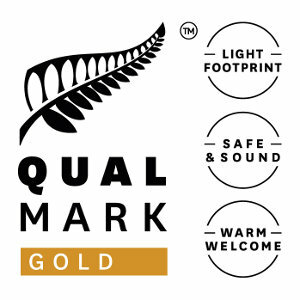 Simply Wild Journeys are the experts in private bespoke luxury travel & adventure experiences in Nelson, New Zealand. There’s nowhere else in the world where you’ll find, within a short distance, three spectacular National Parks, glistening golden sand beaches and turquoise crystal clear waters, alongside alpine meadows and snowy mountain ranges. Enjoy all year in a climate that rivals the Mediterranean. Simply Wild Events can provide your corporate team with a wide range of Conference and Team Activities in the Nelson Tasman region. Contact us to create an experience to remember for your team.